Axis Of Oversteer: Throwback Thursday, Parabolica Edition. 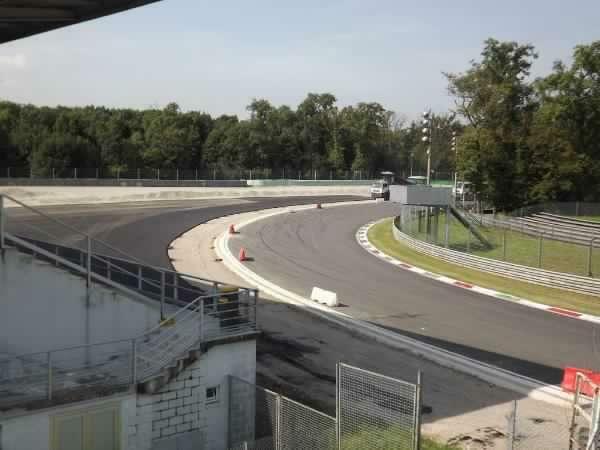 The gravel runoff at Monza's Parabolica is being paved. I have memories of sitting in the stands as a little kid with my dad, watching GT cars go off in a huge cloud of dust there but my son will never see it. Opinions will vary, paved runoff is certainly more forgiving in most circumstances but there is no denying that it takes away from this historic track. Granted, for modern race cars - certainly for F1- the Parabolica is not the challenge it once was but still, I'm sure most would still rather see a driver error penalized with dirty tires or radiators full of gravel than by a steward's decision after reviewing tire position vs a painted white line. But I'm sure teams, mechanics and track officials don't see it that way. Hopefully, the work was done in the context of fixing the drainage issues with the turn which in the past have caused the pavement to buckle and bubble causing big problems for bikes. This was a know issue that track management was aware of yet kept hidden. The circuit's top brass was recorded (in the context of a public funds investigation) discussing how to keep the issue from the public. though it is not a challenge for f1, still drivers will take more risks now instead of being careful which i hate, when drivers thread the throttle and try to be on limit, that corner is kind of epic to watch, what a shame. Then that's the real question: How can we have a paved run off area for safety, but also somehow make drivers that use it pay a price, time-wise? Pave it and coat it glue? Corner workers that are empowered to hold cars in the run off for a time penalty? Something else (most likely). A wider grass strip that guarantees loss of control and track position. Don't be confused, it's not like there was a wall there! There was an enormous (one of the biggest, I think) gravel trap so what it has to do with not being thrilled about people slamming into the side of houses at the TT, I don't know. If you want to be optimistic, let's hope they put the right amount of astroturf on the outer edge and very high grip asphalt bayond so that there is a time penalty for making the error. On the plus side they did fix the drainage issues I mentioned so bikers will not wipe out so easily on the lumpy asphalt. The gravel is still there - a patch is just being tarmac'd for the bikes.